Hot Springs National Park commemorates its 175th anniversary. 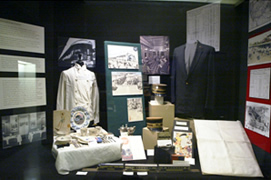 The exhibit, Savoring the Waters: The Early Years at Uncle Sam’s Spa, marks the beginning days of the national park as it developed into the health resort it is today. Created in collaboration with Hot Springs National Park, Savoring the Waters contains enlargements of exceptional imagery drawn from stereo images sold in the years to follow the Civil War. These images present views of developing springs and premature bathhouses and their Victorian substitutions. Postcards from the period, signs, architectural facts and much more bring the city’s tale into the first decades of the Twentieth century, at which time the eight existing spas on Bath House Row were built. In the decades following the Civil War, rail lines were developed to join old towns, and new towns were created as the railroads opened isolated corners to expansion. This development sent Arkansas’s forests, farms and mines into the national marketplace. People followed these rails, setting up countless communities that are familiar to us today. It was the golden era railroading in Arkansas, 1860s through much of the 1970s, and it is the theme of the, Trains (Slow and Fast) Through Arkansas. 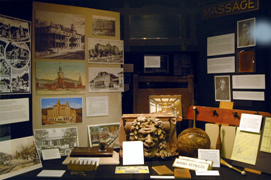 Antique photographs, maps and a selection of artifacts from Arkansas museums and personal collections suggest a point in time in which passengers and mail equally rode the rails between towns; focusing on the main rail lines that ran through Arkansas and highlights the beauty of passenger trains. By the early 1980s, passenger service was almost erased from Arkansas due to the emergence of trucking and air transportation. 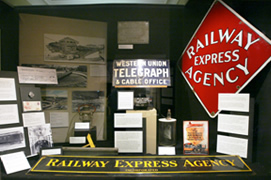 Trains (Slow and Fast) Through Arkansas acknowledges the people and establishments that keep memories of railroading alive, while a number of railroads continue to be a vital part of Arkansas’s transportation structure. 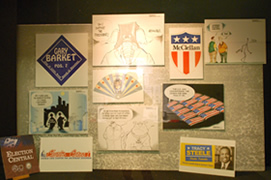 Election Central 2006 presents an assortment of elections-themed resources including maps, candidate photographs and copies of election laws and facts, in addition to creative political cartoons by Arkansans. 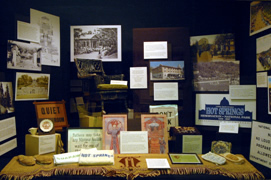 Accompanying these are cases filled with invaluable political memorabilia borrowed from the Butler Center for Arkansas Studies, including rare bumper stickers, handouts, and political buttons. 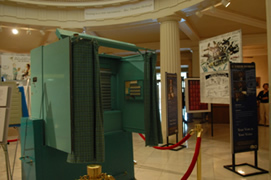 Recognizing the modifications in voting procedures brought by the Help America Vote Act of 2002, this exhibit emphasizes examples of voting history, displaying all types of voting instruments from the early nineteenth century paper ballots to the new iVote touch screen voting machines.